Home / Entertainment / News / Video / Weird / It was a heart-pumping scene when this man holds the sharks head like a pet! It was a heart-pumping scene when this man holds the sharks head like a pet! Reaching out to a huge Great White shark? Crazy yet Incredible! This man petting the shark is Mike Rutzen also known as the “Sharkman” who is an expert in Great White Sharks. As Mike's boat sailed off the coast of South Africa, they caught on a video a man-eating great white shark after showing off it's head above the water. 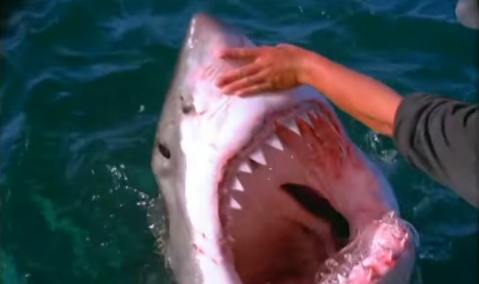 And instead of rushing and speeding off as quickly as possible to stay away from danger, a very brave crew member extends his hand towards the white shark and begins petting it like a pet dog. Mike was a fisherman and reports said that her was challenged to a bet by one of his friends on the boat to do that in exchange for a sum of $1600, which obviously Mike won the bet. As the shark shows off its sharp and gigantic teeth, Mike's arm is just inches away from the sharks razor-sharp like teeth. The video was originally posted by Nature Footage on their YouTube channel in 2009 and now was almost viewed more than 275,000 times. Would you also take the bet and risk your arm?